"Flashes of brilliance and high-spirited exuberance, without sacrificing the richness of sound worthy of the best Czech quartets of recent decades." "The Martinu Quartet mastered the work of its namesake composer, together with marvelous intonation and all the finesse required. Beethoven's Op. 18/6 showcased the Scherzo's spirit and the melancholy of the finale's introduction, with rare moments of expression throughout the work. Dvorák's "American" quartet revealed a lavish celebration of invention, vitality, and fascination with homesick melody; a marvelous end to a concert full of Czech colors and flowers set in a gold frame." 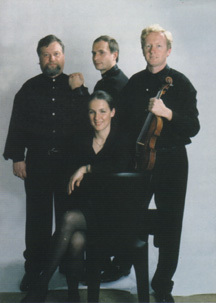 "The Martinu Quartet gave a stunning performance of Smetana's String Quartet No. 1 E-minor." "The Martinu String Quartet displayed not only their technical mastery but also their ability to draw on the broad spectrum of expression in Martinu's Quartet No. 5 captivating the audience with their forceful interpretation which gathered momentum culminating in the Finale." "One of the most balanced groups on the circuit...the Martinu's cellist who shines most radiantly here." The Martinu Quartet does a fantastic job performing all these works. Given the Czech heritage of Mr. Svoboda, this quartet brings an understanding and passion for Czech music to each of these pieces. Their sound is excellent and their interpretation leaves nothing to be desired (other than to hear more). This disc is a bit of a cliffhanger, though. I must now hear the remaining 4 quartets! I wish that the 6 quartets from 2002 - 2006 were released as a set (not unlike Peter Maxwell Davies Naxos Quartets) but I am glad that I have the earlier works as a reference for Mr. Svoboda?s output. I anxiously await Volume 2 of this collection! "On paper, the music looked improbably simple. The clarinet line of "Modlitba" rested largely in the instrument's lower register, with only slight rhythmic alterations turning a basic figure into free-flowing chant. It rose as the piece progressed, naturally taking on a piercing anguish from the different timbre of the higher registers. String parts often proceeded together in quarter - and eighth-note lock step,with little more than rests and shifts to staggered imitation of motifs to lend a sense of development." But the development was inexorable, and the sense of fear and dread palpable. Here were the echoes of Crumb, in the hair-raising, glassy sounds that opened the String Quartet, and of Shostakovich, in the almost grotesque, gut-wrenching climaxes of both pieces. There was also a frank and pitiless quality about the music, even as Frajola put down his violin to beat a bass drum in the funereal finale of the Quartet. This is not about how you feel, it seemed to say, this is what it is. Now what?" "...beautifully recorded...all well-crafted...memorable moments...propulsive flourishes..."
"...lots of catchy tunes and rhythmic twists...considerable variety in tempo and energy-level...mood typically straightforward and unexaggerated...style a consistent, easily approachable, modern-but-conservative idiom based on enriched tonal harmonies and traditional procedures and textures."